The Canadian dollar was trading somewhat lower on Wednesday and the USDCAD pair was hovering around 1.2580 during the London session, with further volatility expected later in the day. Investors will focus on today’s Bank of Canada meeting. The central bank is forecast to leave monetary policy unchanged, with the main rate expected to stay at 1.25%. Six weeks ago, the central bank expressed concerns about lower wage and household credit growth but since then, oil prices hit a 3 year high, retail sales rebounded, the unemployment rate declined, job growth accelerated, housing market activity improved, inflation increased and manufacturing activity expanded at healthy rate. Therefore, the BoC could sound hawkish and hint at faster pace of tightening, ergo faster rate hikes. This could be Loonie positive. Oil continues to strengthen on Wednesday, which is also supportive for the Canadian dollar. 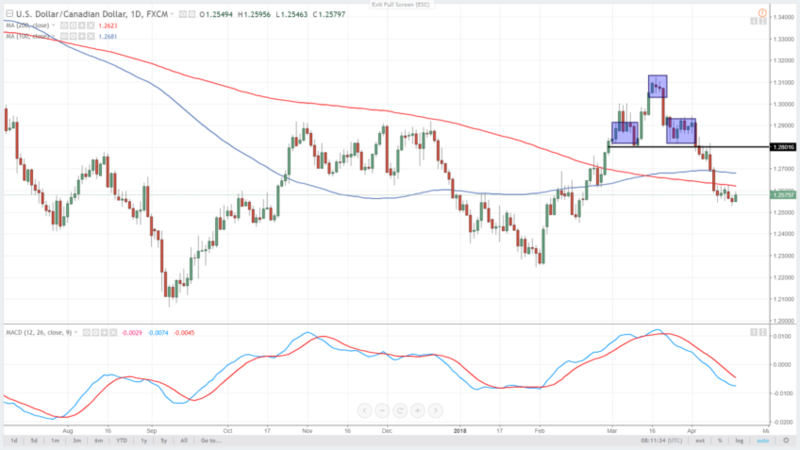 The USDCAD pair is nearing the 200 day moving average, which is located around 1.2620. there is a chance that the pair will test this level after the BoC decision, but as long as it trades below, the short-term trend appears bearish. On the other hand, the support is at the current swing lows near 1.2530 and if not held, further decline below the 1.25 mark could occur. As previously mentioned, the outlook looks bullish for the Canadian dollar, due to the positive fundamental and technical situation. In all cases we strongly recommend to have rigorous money and risk management. Legal: TopForex is a registered brand name of Goldenburg Group Limited, a Cyprus Investment Firm (CIF) supervised and regulated by the Cyprus Securities and Exchange Commission (CySEC) with CIF Licence No 242/14 with a registered address at 1 Siafi, Porto Bello Building, 3rd Floor, flat/office 303, 3042 Limassol, Cyprus.